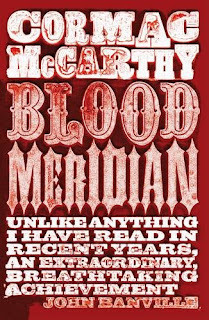 In my pursuit of reading broadly, I read Blood Meridian by Cormac McCarthy over the Christmas period. Not the nicest of stories to be reading during a time when everyone is in a festive mood. This novel certainly put me in a reflective and withdrawn mood. It also took me a while to read, because the language is complex, and the lengthy descriptions caused my mind to wander. Like The Road, this book leaves you feeling disturbed, and like you are surfacing from a nightmare every time you put the book down. Also like The Road, the main character is never named (perhaps so we don't get too close to him, or give him a real identity), and only ever referred to as 'the boy'. This story is about the good and evil inside men. On the surface, is follows 'the boy' over a period in his life when he joined a group of men hunting and killing and scalping native Americans for money. 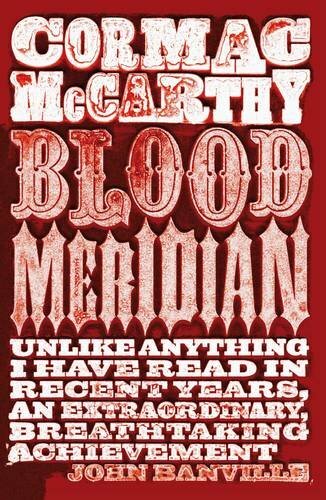 There is blood dripping from every page of this book. The landscape is bleak, and there are bodies piled up everywhere. But underneath the gore and the horror, this book is about good and evil. The kid has a taste for mindless violence, but I believe this is due to his isolation and his youth. He later derides another young man for his admiration of 'meanness'. I've read a few other blogs that have been written on this novel, and I did not interpret the character of 'the judge' in the same way as others. The judge is a formidable character, and completely unbelievable. He is seven foot tall, completely hairless, highly intelligent, can speak multiple languages, a great musician, an agile dancer, a lawyer or judge (he knows a lot of law), a mediator, and many other things. I think he is either the devil, or a fallen angel. He thinks that things shouldn't exist unless he is aware of them. He thinks that war is the primary nature of man. He leads all the other characters is the novel astray. Blood and violence is all around him, and he manipulates situations to increase violence (despite not often participating in it himself). He is responsible for many children going missing and being killed (but tortured first) throughout the novel. This is more than a horror novel. It is difficult to read, and quite subtle. As it says on the front page, this is 'unlike anything I have read ... an extraordinary and breathtaking achievement'. I have to admit - I never did get through this. I think it was a combination of both the density and the subject matter. This was a good review, though, and for those whose tastes run toward dark lit, I think I might recommend that they give it a go.